When seeking to improve biogas plant efficiency understanding why Ferrous Chloride Not Ferric Chloride is Best an be important. At the start of my recent enquiry, the expert from Lukeneder helped by explaining the differences between Ferrous Choride and Ferric Chloride. I think that my reaction of confusion, as I looked at the Lukeneder brochure just before that, must have been very evident! I was expecting to see that the biogas plant efficiency product (biogas booster) on offer (Deuto-Clear® Sulfo) would be based upon Ferric Chloride (FeCl3), not Ferrous Chloride (FeCl2), after all as far as I was aware, that is the iron compound traditionally most often used in water treatment applications. View this description of the Lukeneder Deuto-Clear® Sulfo product on YouTube. Dr. Naoimh McMahon soon realized that I was wrestling with this “Ferric vs Ferrous” conundrum, as possibly one or two others as lacking in knowledge as me will have been throughout the show. However, she was quick to explain that Lukeneder GmbH offers their “ferrous” based solution to improved biogas plant efficiency, and it is named “Deuto Clear® Sulfo”. Their product is far more than just ferrous chloride, it is understood,, and it is a ready-to-use solution containing metal salts and trace elements, and they have found that it has a superior ability to bind the hydrogen sulphide and ammonia in the digestate, and is a far better product to use than solely Ferric Chloride (or indeed just Ferrous Chloride alone). Hydrogen Sulphide (H2S) even in small quantities, and high ammonia (NH3) both in the digester liquor and in trace quantities in biogas, are high in the list of concerns for most biogas plant operators. That is why I think that for all but a very few of the most consistent feedstock sources, and readily digestible anaerobic digestion feedstocks, it is self-evident that there are big advantages to avoiding the build-up of H2S and NH3. The place to do that is at the source of the problem, in the digester – rather than clean-up the gas-flow to remove these substances from the biogas before it reaches gas engines or other corrosion-sensitive equipment. A policy of H2S prevention, and the avoidance of continually high (and biochemical process inhibiting) ammonia concentrations, not only helps to stabilise the whole methane production process, it also allows Anaerobic Digestion plants to produce more gas of a better quality. This is achieved without changing the feedstock, it is understood, and occurs over a period of time. A true “win-win” situation. So, to put it simply, prevention of anaerobic digestion process problems is way better than cure! From our studying the Lukeneder case studies provided it appears that increased power generated as a result of dosing with Deuto-Clear® Sulfo, combined with input from their technicians to get the dose just right, has resulted in increased income amounting to 5 to 7 times the cost of the chemical supplied, which can be a net additional biogas plant income of 100,000 Euros, or more, annually for large Anaerobic Digestion Plants. Lukeneder also provided me with copies of two case studies, and their “Customer Reports” document that gives further detail on how Deuto Clear® Sulfo benefits their customers. The case studies show how H2S and NH3 have been consistently reduced over time by the use of Deuto Clear® Sulfo. 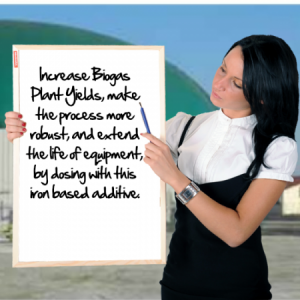 Both H2S and NH3 can inhibit the growth of the organisms that produce biogas. The information provided by Lukeneder appears to strongly reinforce the theory. By holding sulphur and ammonia ions bound into much less toxic compounds, methane production does appear to be increased substantially with the use of Deuto Clear® Sulfo biogas booster. “Although no oxygen is used for desulphurisation, we have found the biology is working much better. We have no more ammonia inhibition although our NH4 is very high. The better working biology has led the substrate being far more ‘liquidy’, as there is reduced viscosity in the liquid phase. This also means no more floating layers making it easier to stir and pump”. 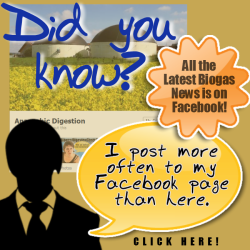 gas engines run better on the unrefined biogas. Ferrous chloride and ferric both have some remarkable qualities. didn’t know they could be applied to raising the biogas from these plants like that though.